We whipped these up at Christmas and just now got around to posting the recipe. They were a big hit! I hope you try it out and enjoy them. You can see all my recipes here. A tasty and quick Keto dessert! Pour the cream into a small saucepan. Bring the cream up to a simmer over low heat. Remove from the heat and quickly add the chocolate, sweetener, butter and peppermint essence. Stir quickly and gently to melt the chocolate and butter and help the sweetener dissolve. Taste a tiny amount to check it’s sweet and minty enough to your liking, stirring through more sweetener or peppermint essence if you think it needs it. Allow to cool then refrigerate for a few hours until thickened and the mixture can easily be rolled into balls. 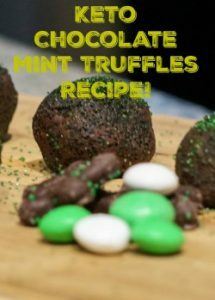 Once the truffles mixture has thickened, remove from the fridge and roll into balls, using a teaspoon of the mixture per ball. 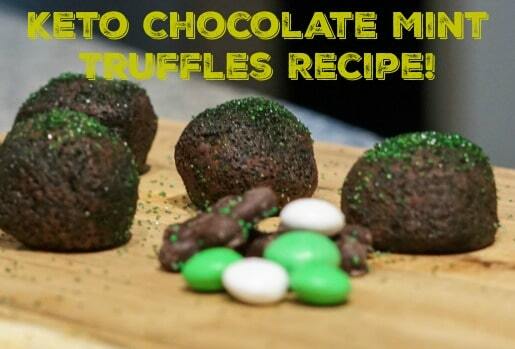 You could leave the balls as is or dip into cacao, coconut or more melted chocolate. PREVIOUS POST Previous post: Keto Meat Up in Arlington TX!